ZOOM Technologies (Middle East, a subsidiary of the US-based Zoom Technologies Inc., has announced the launch of operations in the Middle East with an office at the Dubai Internet City (DIC). The $35 million worldwide group has large operations in Europe, Asia Pacific and India. The office at Dubai Internet City will be the headquarters for Zoom operations in the Middle East and North Africa, and will address markets in Saudi Arabia, Oman, Bahrain, Qatar, Kuwait and Iran. Zoom has already invested over Dh1 million in establishing its state-of-the-art facility at DIC and will be investing another Dh5 million in the first year of its operations. M H Noble, CEO, Asia Pacific, and Gary Bridwater General Manager, Middle East gave a presentation on Zoom to IT professional at the DIC. Zoom is a professiona Organization with expertise in various emerging technologiessuch as ISDN, Data Communications, WAN solutions, Network Security and high end WAN training. Zoom has chosen to be a true consulting firm and work with clients to determine what their needs are so that they can recommend the best solutions, Zoom offers solutions on several products such as Cisco, Cyclades, RAD, and Taisal Gateways. 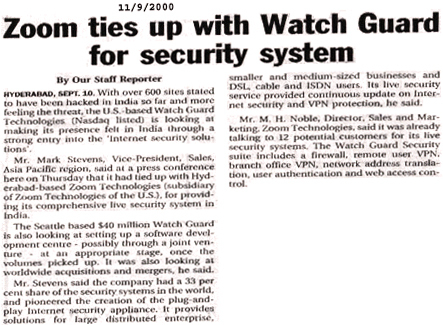 Zoom solutions are being used by several organizations worldwide. 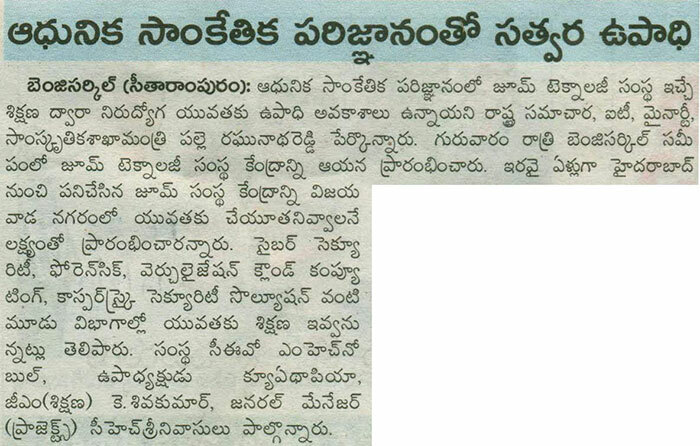 Hyderabad: Zoom Technologies has implemented a WAN connectivity solution for the AP Stamps and Registration Department connecting 22 locations on a pilot scale basis. 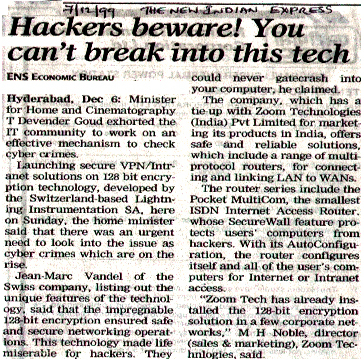 The solution, which the company claims is cost-effective, has been implemented using ISDN connection at a total cost of Rs.11 lakh connecting 22 locations to the departments centralised database server. 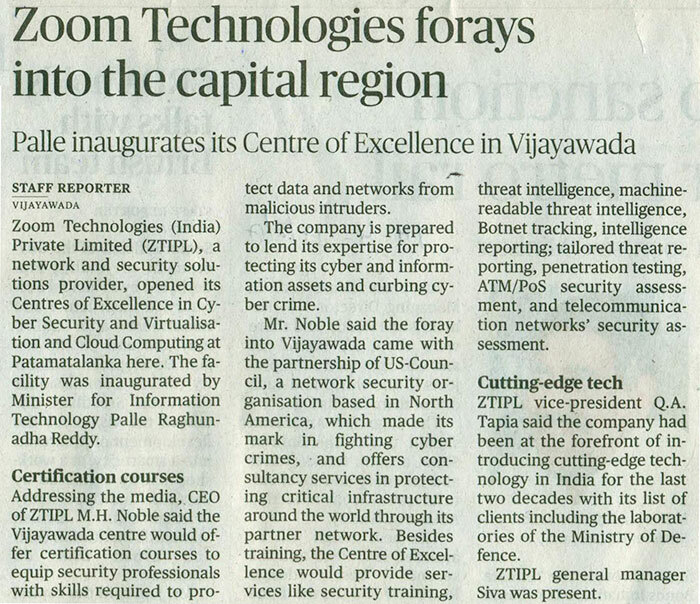 "The traditional leased line connectivity at 22 locations could have cost more than Rs.75 lakh with 44 pairs of modems and 22 routers, " the company's Sales and Marketing Director, M H Noble told a press conference here. He said the ISDN based solution using 128-bit encryption facility costs one-tenth of a solution using the leased line connectivity. 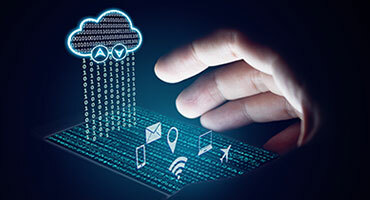 LIGHTNING Instrumentation SA, a leading player in secure internet access gateways, has launched easy-to-use firewall products, MultiCom SpeedSurf, Ethernet II and Ethernet III in the Indian Market. 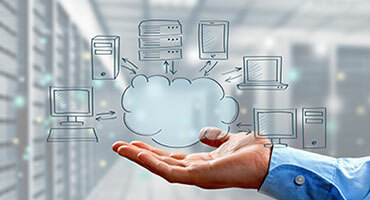 The products are internet access gateways combining LAN-WAN connectivity over Ethernet providing secure high-speed Web access for business and home users. 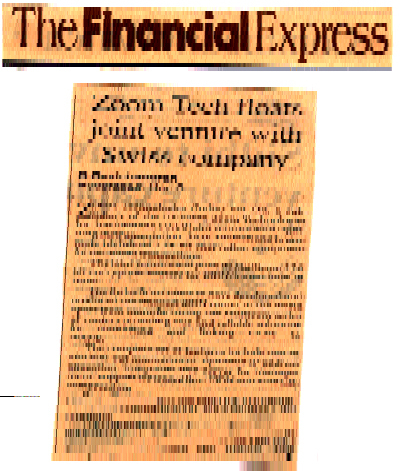 Switzerland-based Lightning, which has joint venture agreement with Zoom Technologies (India) for promoting Multicom products in India, launched the products in Hyderabad on Saturday. Addressing a press conference, Lightning's international sales manager, Mr Daniel Grenier said MultiCom SpeedSurf represents a new generation of secure Ethernet to Ethernet gateways that enable optimal use of network resources combined with flexibility and cost-effectiveness. HYDERABAD, SEPT.12. Zoom Technologies has demonstrated the cost effectiveness of an "ISDN Connectivity" (Integrated Service Digital Network) based solution as compared to the conventional leased line connectivity, in a project of the Stamps and Registration Department, linking 22 locations. 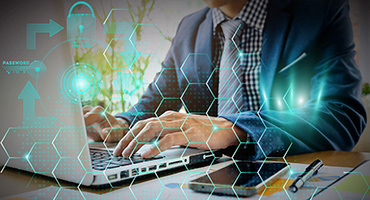 The Wide Area Network (WAN) connectivity project in 22 of the 300 locations of the department was implemented a few months ago by Zoom Technologies at a cost of about Rs. 11 lakhs. 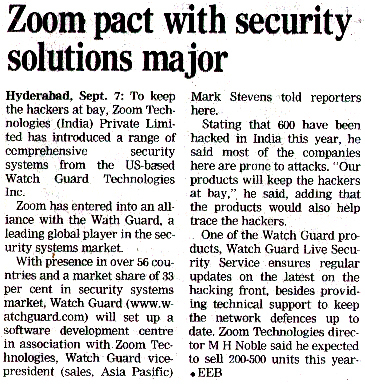 Making a presentation on "WAN connectivity of Stamps and Registration Department", here on Tuesday, Mr.M.H.Noble, Director, Sales and MArketing, claimed that the solution, prevalent elsewhere in the world, was however introduced for the first time in India by Zoom. Mr.Noble claimed the solution reduced the cost of infrastructure to about one tenth of that incurred by the leased line solution. 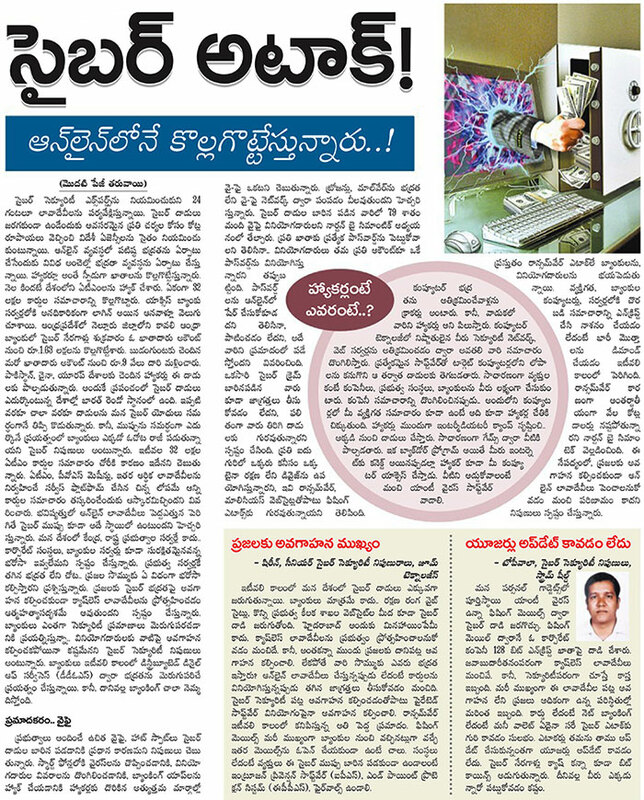 For WAN connectivity for 22 locations using the leased lines, the cost would have been about Rs. 84 lakhs, he calculated.